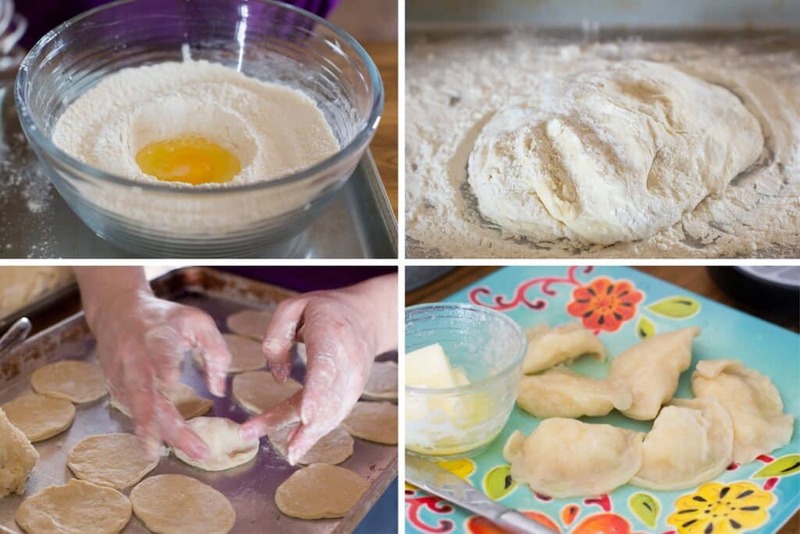 Do you know how to make Pierogi? Buttery, crisp Polish Pierogies stuffed with potatoes, cheese, and sauerkraut are a holiday favorite from the very first bite for everyone who tries them. There are a lot of steps to this Pierogi recipe but don’t let that intimidate you. Anyone can do it! You can make a big batch at a time and freeze some for later. It’s also a ton of fun to turn Pierogi making into a big event. Grab friends and family and spend an afternoon rolling, stuffing and cooking these delicious dumplings together. My sister Jenny taught me how to make Polish pierogies years ago; the same way that her Mother-In-Law Jane taught her to make them. Last time we were together for Christmas, we made a double batch of these pierogies and our small crowd ate almost all of them! Pierogies are a dough dumpling traditionally stuffed with potatoes, cheese, and/or sauerkraut. First boiled and then fried in butter, these little potato filled pockets are irresistible. I’m including our family’s favorite combination of potato, cheese, and sauerkraut in the recipe below. We serve these pierogies with Polish Kapusta and everyone loves the combination. I’m told that while Jane was growing up, it was common to ask your guests ahead of time whether they preferred potato/cheese or sauerkraut/cheese pierogies. Many people are very particular about their pierogi fillings! 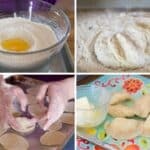 I discovered this for myself when I asked how you all like your pierogies! There are countless other filling options: meats, fruits, vegetables, the combinations are endless. Making homemade Pierogi starts with a great filling. Simmer peeled, cut potatoes in a pot of water for 15 minutes until fork tender. Mash the cooked potatoes, then stick them in the fridge to cool completely. While the potatoes cool, saute the chopped onion in a little olive oil until softened. Add the onion and oil to the cooled potatoes along with the sauerkraut and cheeses. We learned how to make pierogies with Farmer’s cheese, a pot cheese that comes in a container and is very soft. If you can not locate farmer’s cheese in your market, you can substitute 2 ounces shredded Monterrey jack and 2 ounces ricotta cheese. Store the filling in the refrigerator until your dough is ready. Tip: To save time on the day you’re making and serving your pierogies, make the filling a day or two in advance then keep it sealed tight in the fridge until ready to use. We find it easiest to rotate in batches of six to manage the process most efficiently. 6 waiting, 6 boiling, 6 cooling, 6 frying, repeat. It sounds a little overwhelming initially, but once you have a little assembly line set up, it goes fairly smoothly. We fill 18 pierogies before starting the first batch boiling and then just keep rotating through the stages. This is a half recipe and it can easily be multiplied for a crowd. We’ve found that this amount is much more manageable, especially for the first few times we made these. Pierogi dough is a simple mixture of flour, egg, water and just a touch of salt, not unlike homemade fresh pasta. 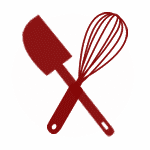 After mixing together the flour and salt, crack an egg into the center of the bowl and combine with the flour mixture. Gradually add hot water to the bowl until your dough is soft and slightly sticky. If the dough appears too wet, add more flour a tablespoon at a time. Likewise, if the dough is too crumbly and dry, add more hot water a little at a time. Chill the dough in the refrigerator for an hour or so until cool and firm. Here comes the fun part. You get to roll out the dough, shape and stuff your pierogies, then give them a bath in boiling hot water. Start the water boiling on the stove while you get all your ingredients out of the fridge and ready. Make sure to have a counter space or table cleaned and cleared so you can put the pierogies together without interruption. First, divide the dough into four sections. Roll the first section out until it’s very thin, about 1/8 inch in thickness. Cut this section into circles, then place a tablespoon of the potato filling on each side. Fold the circles over and pinch the edges to seal. Repeat this with the other sections of the dough and then place your prepared pierogies in a single layer on a plate or pan. Plop the dumplings a few at a time into the boiling water. If they stick to the bottom of the pot, give them a quick nudge with a spoon or spatula. When the pierogies rise to the top, scoop them out with a slotted spoon and place them on a buttered plate to cool for a few minutes. Once slightly cooled, it’s time to fry your waiting pierogies in butter. Fry a few at a time until the edges are brown and crisp. If you have a team of folks working in the kitchen, you can set up an assembly line to make finishing these steps quicker and easier. Have someone assembling the dumplings, someone boiling, and someone frying. You’ll be ready to sit down to a delicious, buttery plate full of Polish Pierogies in no time. These are satisfying enough all on their own as a snack, appetizer or even a meal. Pierogies pair especially well with cabbage dishes like this Cabbage and Sausage Skillet, Layered Cabbage Rolls, White Beans and Cabbage, or this Spicy Cabbage. This recipe includes my family’s standard filling of potato, sauerkraut, and cheese but you can use this same recipe as a guideline for cooking Pierogies with any kind of filling you like. Leftover pierogies freeze like a charm, too! Place them on a single layer on a cookie sheet until just frozen (an hour or two) before sealing them in airtight containers and storing in the freezer. Kitchen Tip: I use this pot, this pan, and this spider to make this recipe. Buttery, crisp pierogies stuffed with potatoes, cheese, and sauerkraut are a favorite around the world. Place the potatoes in a large pot and cover with water. Bring to a boil and then simmer until fork tender, about 15 minutes. Drain the water and mash the potatoes. Place the potatoes in a mixing bowl and chill in the refrigerator until cold. In a small skillet over medium heat, warm the oil and then saute the onion until tender. Let them cool for a few minutes and then add the cooked onions to the bowl of cold mashed potatoes. Place the sauerkraut in a strainer and rinse very well under running water, for at least 3 minutes. Drain thoroughly and add the sauerkraut to the bowl with the potatoes. Add the cheese and stir to combine. Store in the refrigerator until ready to make the pierogies. The filling can be made a day or two in advance and refrigerated until needed. Place the flour and salt in a large bowl and stir to combine. Make a small well with your hand and crack the egg into it. Stir to combine and then gradually add the hot water, mixing with your hands until the dough is very sticky and well combined. If it becomes too sticky and wet, add just a tablespoon or so more flour. The photo on the left is too wet, the one on the right (with the spoon in the bowl) is perfect. Chill the dough in the refrigerator for at least an hour. Bring a pot of water to a boil. Sprinkle a large board with flour. Transfer the dough to the floured surface and flip it over a few times to coat with flour. Gently knead the dough just a few times with your hands, adding a sprinkling of flour as needed. Shaping pierogies: Divide the dough into four sections and roll out one of the sections very thin, to about 1/8" thickness. (This should be just a bit thinner than a pie crust.) Cut into circles and place 1 tablespoon of the potato filling on one side. Fold over the circle and pinch around the dough. Place the prepared pierogies in a single layer onto a waiting plate. Don't stack them or the dough will stick together. Boiling pierogies: Drop the waiting pierogies into the water, a few at a time. Use a spoon or spatula to gently nudge them off the bottom of the pot if they stick. When they float to the surface of the water, lift them out carefully with a slotted spoon. Place them on a buttered plate and drizzle a small amount of melted butter on top of them to prevent sticking together. Let the boiled pierogies cool for a few minutes before frying them. 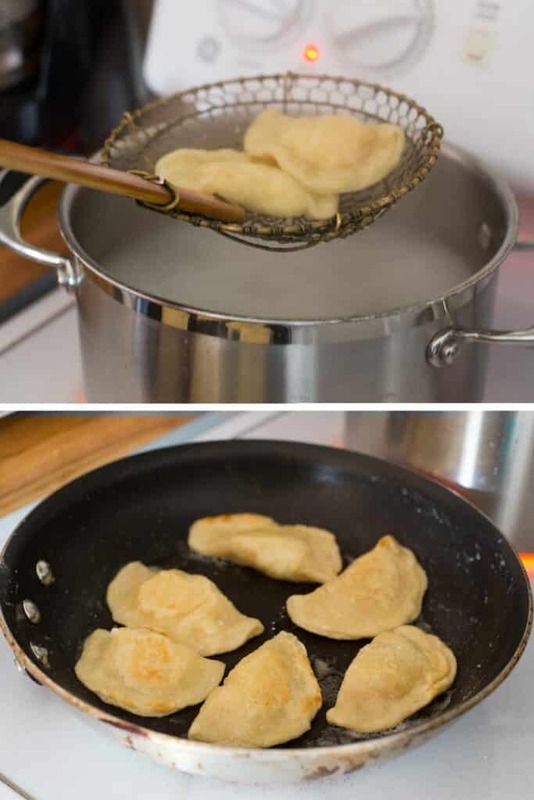 Frying pierogies: In a large skillet over medium heat, melt a tablespoon of butter. When the butter sizzles, place the boiled pierogies in the skillet in a single layer. Let them cook 2-3 minutes, until lightly browned on the edges, flip over and repeat. The pierogies will not turn brown all over, but the edges should crisp and be light brown. Remove the finished pierogies to a buttered baking dish. This is a half recipe and it can easily be multiplied for a crowd. We've found that this amount is much more manageable, especially for the first few times we made these. Do you have to boil them first if you just like them fried. Yes, you'll want to boil them to cook them through. The fried pieorogies are my favorite as well. Can you freeze them after boiling? Yes, they will freeze nicely. If you freeze them after boiling, do you thaw them and fry them? How would you reheat the frozen, already boiled ones? Also, if you freeze them BEFORE boiling, would you put them directly into boiling water frozen or thaw them before boiling? Regardless of whether you freeze them before or after boiling, I would thaw them first. Can you freeze before boiling? If dusted with a bit of flour? We have always used corn meal instead of flour when freezing. Place perogies on a cookie sheet sprinkle with corn meal and put in freezer. Once frozen place them in zip top freezer bags and put back in freezer. Our family does cottage cheese, bacon and chopped onion. We do the regular dough, not with potatoes. Drop in boiling water, when they come to the top we simmer for 14 minutes. Cut open place butter inside and salt and pepper. My grandfather came from Lithuania, grandma was Polish. I LOVE this recipe,they came out perfect. 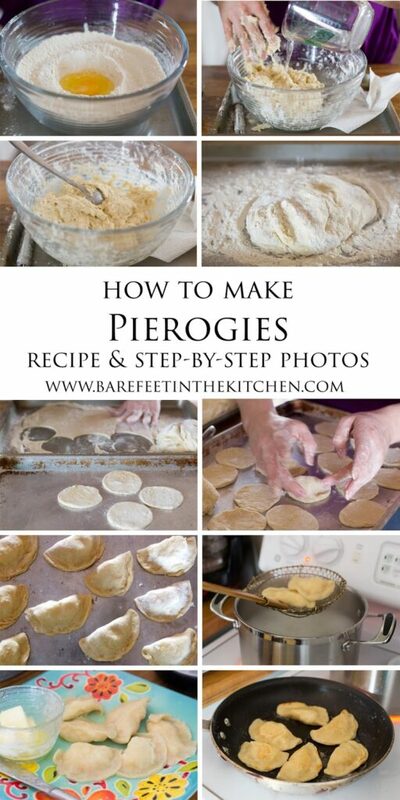 How many pierogies does this recipe yield? This is in no way a reflection of the recipe provided. I am new to making pirogies and had a several issues with my attempt at making them. Rolling out the dough was tough (I am not skilled at this function). I did try to follow the directions as best I could. Removing the pirogi when it floated to the top did not produce a cooked dough so it was somewhat hard. The amount of dough it took to close the clam shape was too much in comparison to the filling (I used the clam shaped tool specifically for pirogies). The taste of the filling is easily rectified (I overdrained the sauerkraut) but the skill set of the working with the dough is humbling. Any suggestions for getting a better tasting dough with less used in the finished product? I've never used a tool to make pierogies. I wonder if it requires a different amount of dough and filling? Iwhat can I use if I can't find farmers cheese? If you can not locate farmer’s cheese in your market, you can substitute 2 ounces shredded Monterrey jack and 2 ounces ricotta cheese. This was my first time attempting homemade perogies! I made them with my sons girlfriend, and the recipe was truly fool proof! The photos were a huge help, so we knew what we were aiming for! Thank you so much for simplifying what was presenting as a daunting task! Everyone loved them! We tried both cheese options and agreed we liked the farmers cheese a bit more than the jack/ricotta mix. But they were very similar! I haven't had pierogies in ages! Thanks so much for sharing this. Cannot wait to make some at home. The sauerkraut filling is great too! I hope you love them as much as we do, Billy! Oh, I am so very happy that you liked the pierogies, Hannah!